Yesterday I entered my friend’s Yugioh tourney. I played Infernoids still lacking the only card that makes them viable in this format (Twin Twisters). I only reminisce on this because of a beautiful sequence of plays round 2, where I outed a board that no Infernoid player should be able to play through. I played against one of the best FoW players I personally know. He had added Heros to his Magician deck, but had been out of practice for a white. Our Game 1 went by pretty fast as he didn’t open Pendulum Call allowing Devyaty to torch both his scales and Sky Iris. Game 2 my opponent made a turn 1 Odd Eyes Absolute Dragon and Mist Valley Apex Avian. However, I baited out the Apex with a MST before activating Void Imagination to summon Infernoid Tierra. The ensuing train of value drowned said Absolute winning me the game before Apex could fly back to the field. So this round was pretty intense. I took game 1 through a great Reasoning mill/Devyaty. He takes game 2 thanks to a well timed Dimensional Fissure and Thunder King. I had lost hope after dropping to 1100 life due to repeated Thunder King attacks. My hand was filled with Infernoids and my backrow was filled with stunted spells. With one turn left I top-deck MST and fired it off on Necrovalley. He tributes Herald to negate it, causing Vanity’s to die. I summon Harmadik and he Book of Moons it. I then summon another Harmadik with forces the Thunder King negate. I follow with Patrulea to pop Necrovalley. After-which I activated Instant Fusion to bring out Elder Entity Norden and a dead Decatron. I synchro summon Trishula, Dragon of the Ice Barrier to remove his Glow-up Bulb, Dimensional Fissure and a card from the hand. I summon Raiden and push for damage. My opponent surrendered on the following turn. After Magician Heroes defeated Yang Zing Unicorns, we had a rematch. Devyaty wiped his board (his scales more importantly). He made a misplay searching an Oafdragon of of Wisdom Eye and got locked into a 2 and 3 scale. My opponent scooped the match at that point saying the misplays were too much. Void Imagination is what got me excited to play Noids again. It’s a really interesting card that gives a lot of utility to the Infernoids whether by allowing you to overextend by summoning all of them or through its intended role as a Foolish Burial for 6. Mystical Space Typhoon should be a Twin Twister. I’ve just been too lazy to get them despite their being so cheap. Devyaty overachieved this evening, but when its effect both on summon and while on board is beyond oppressive. My monarch decks have been paid for. That being said I decided not to give up on Infernoids so I don’t really know what I’m doing right now in Yugioh. My BOSH box wound up being an eBay scheme (seller listed box pre-orders, then left eBay without actually shipping them. This same situation happened to me oddly enough back during Fate Reforged). I’ll get refunded at some point, but it’s both frustrating and a relief since BOSH card prices are very low due to the foil in every pack changes. More than likely I’ll buy everything I wanted on tcgplayer for less than the box overall. Force of Will Bahamut Deck Profile and Tournament Report, No matter the situation we have a ruler for that! Game 1 I outpaced his set-up with Bahamut. Game 2 I sided into Reflect. I believed he managed to cheat out Yamata, but I had Refrain to bounce it (no Realm of Pure Spirits). Game 1 we have a decent back and forth and I get him to low life. He manages to pull off Alice’s World and direct attacks me with double Gwiber before using Deep Blue to summon Alice’s Little Assault Force to game me. Game 2 I sided into Reflect and added in my Sign to the Futures, Split Heaven and Earths, Rapid Decay and Susanowos. I may have aggressively sided, but it did the trick as the Signs prevented him from getting anywhere near enough dudes for Alice’s World. I defeated him by searching multiple Splits off of Refrain. I dropped out from the tournament at this point though I learned that Mono-Red Reflect took 1st and 2nd place overall. So in order to divide up the promos and mat from our TTW we had a tournament earlier today to decide who got what. I messed up this game not realizing my opponent had a turn 4 Slyvia using Fiethsing. I was forced to Thunder my own Cthugha to deny him the stone recovery effect. After that I barely pulled out a win by Splitting him for 600 and then closing with a Thunder. Game 2 sided into Reflect and managed to drop Susanowo against his Slyvia. From there I made the proper decision to attack him directly boosting Susanowo to 1600 with Reflect/Little Red. After that with a Thunder in hand I J-Activated and passed with 1900 life. He summoned Lancelot prompting my unsummon with Refrain. He then crashed Slyiva to kill Susanowo before passing. I then cast Thunder for game. Never would I thought I would have this much trouble against Faria. She hit me like a truck for 1600 damage after I got him down to 1300 life with Bahamut attacks. I made a colossal misplay by running my only Flame Sprite into his Artemis Bow. From there I had no creatures and died. Game 2 I sided into Reflect boarding into Deathscythe and Sign to the Future. I controlled the board with the Lancelot + Reflect + Little Red Combo to tear apart his light resonators. The 700 damage killed literally all of his small creatures (Grimm, Pandora and Percival). Game 3 he made the mistake of casting Gwiber and then running over my Rukh Egg. I searched out Susanowo and crushed his Gwiber. Susanowo then took control of the game eventually trading with Faria herself allowing Lancelot to swing for game. Game 1 I had the perfect aggro opening and got my opponent to very low life. I finished him with Thunder to the face. Game 2 I boarded into Reflect with Susanowo and Deathscythe, but my opponent also boarded into Reflect. I had an opening hand of double Cthugha, but luckily I drew into Flame Sprite for the easy turn 1200 damage. I dropped double Change the World and passed. He responded with 2 Marybells and a Bow. My opponent got behind as my Lancelots pumped by Reflect wormed their way through his bows. My most proud play though was when I had Flame Sprite and Cthugha on board staring down 2 Bows. I had a Lancelot in hand. I sent the first Cthugha which got hit by Thunder. Then Flame Sprite got hit by one bow. This gave the me the window to send in Lancelot for a boosted direct attack. I won the game on the next turn my searching Thunder both on my opponent’s turn and again on my own turn for game. This deck plays like a 28 regalia Bahamut deck Game 1 and turns into Aggro Reflect/Refrain Games 2&3. This is great because my opponents often side incorrectly giving me a slight advantage (the only card that beats both decks is Barrier of Shadows and that does not beat R/R). The real benefit of this deck is the +200/+200 to Lancelot from Reflect which makes his 700 damage effect alot more consistent. Anyway, I won this mat for the friends tournament (my first FoW mat!). I’ve been very happy with this deck so far, but I’m still actively editing it. I’m hoping to have a decent enough deck to use competitively at events. I just got back from the Oath Pre-Release. We opened really well (see featured image), but were defeated earlier on in the event. I am still cursed to lose in the first round of 2HG every time I attempt. I played Green/Black Eldrazi while my teammate played Red/Blue Surge. As pictured my high end finishers were Bane of Bala Ged and Endbringer (my favorite creature in this set). My partner opened 2 Chandra, Flamecallers (one normal, one promo) and filled his deck with semi-cheap removal. 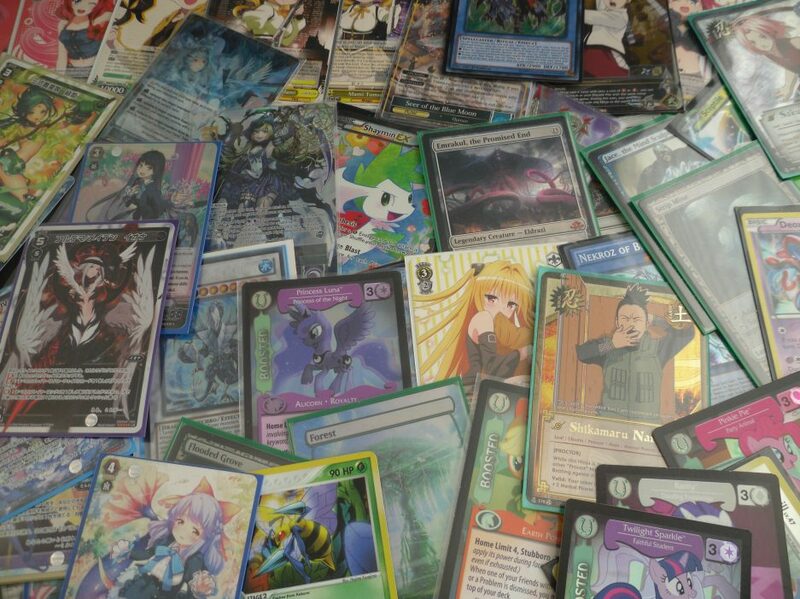 These were my rares. My teammate used the Brutal Expulsion and the Oath of Chandra (full Chandra flavor over here). I ran the Hissing Quagmire as the rationale for my deck. I made sure to think about our early game during deck building, but clearly it wasn’t enough due to how poorly our rounds went. So this game was us getting attacked consistently by 3/2 or 2/1 Allies and by the Surge 3/3 Flyer. What happened was I sacked my Call of the Scion tokens to cast Bane of Bala Ged over Endbringer. They then tapped it down with the Ally tap creature. From there we were ravaged. Our final score was 0 to 30. Our only real mistake was not casting Endbringer over Bane of Bala Ged. We couldn’t have known. Also being on the defensive in 2HG is really rough. Bar a board-sweeper there was no way to get back once you’re behind. So we gt ahead in the early game with Tunneling Geopede. However, our opponents dropped Linvala on us. They got the 3/3 Angel and regained 5 life. They Stasis Snared our Reach blocker and flew over us for game. The painful part of this game was that my partner was stuck on 1 Mountain with 2 Chandras and a Tyrant of Valakut in hand. We died one turn away from the 2nd Mountain. No misplays here,just bad luck land-wise. We dropped after that, which is when I opened decently in my pity pack (the foil Island and the Thought-Knot Seer. All in all this was an underwhelming pre-release and I don’t really care for this set (which is why I’m not going back to enter again tomorrow). That being said I can’t complain since I actually got an expedition, which is the best thing you can pull in this block. I’m holding on to the Flooded Grove for this reason. I don’t mean to demean or hate on this set though. The mechanics and artwork of this set are very interesting and will have profound effects on Standard and Modern. That being said I probably won’t be buying any MTG until Shadows Over Innistrad. That was until I found a really good deal on the Daretti Commander deck at a closing store on the way back from pre-release. This gave me a bunch of decent commander staples and possibly the core for another deck to sell on ebay. Anyway, thanks for reading as usual. I wish anyone attending pre-release this weekend a great time and better in-game luck than me. So Oath of the Gatewatch Pre-Release is literally a few hours away, but I wanted to mull over how deep I’ve gone into Pokemon in the last few days. So this was the first wave of cards I ordered after a friend of mine started to explain this game to me. Despite all my preconceptions Pokemon actually appears to be a balanced game (though reading any given trainer card makes the MTG/Ygo player in me squirm in terror). This was the second wave of orders (with the earlier ones underneath). My current goal is to build 2 decks for my favorite Pokemon Beedrill. One in Standard and one in Unlimited, which are literally just Standard and Legacy from Magic. These cards are very cheap. The staples of the current format cost me a mostly quarters. The recent errata of Reflect/Refrain (I got to play it at full power for one event) has got me once again confused about what to do in FoW. I really like playing R/R, but I’m tempted to go back to Bahamut. I’m also testing a weird combo deck with a friend, but more on that later. Yugioh is approaching a tier 0 meta with Performage Pendulums (PePe/EmEm) poised to dominate for the next few months. I decided I gave up on Infernoids too quickly. For that reason I acquired the following cards in preparation for the format. More specifically I got a 3rd Harmadik and Raidan alongside the fusion monster and an Electromagnetic Turtle. I want to get 3 Twin Twisters for the deck (which I might actually do with how cheap it is right 0_0), but its not really pressing at all. The abysmally low prices of BOSH cards has me somewhat worried though about cracking my box in general. However, that’s a topic for another time also. Maybe elves can ascend to a higher tier in the format. So onto the other stuff before I keel over and wake up just in time to open Inverter of Truth in Sealed. I started brewing a 4-color Madoka deck after being gifted 2 Level 3 Mamis. I have no idea if it will work, but I’m really excited to try and make a single coherent deck (The To Loveru is a work in progress, but darn I have no idea where to go with that set). I’ve come to learn that while I was completely ignoring this game that multiple sets dropped and that the next set features new support for Iona (the only girl whose mechanics I totally remember). I am very tempted to buy into this set. Before you go into this post, please ask yourself if you MIGHT be offended or made uncomfortable by the art/content of these cards (which are based on this anime). If you think for a moment that you might be, then please do not go any farther. This is one of my favorite animes (cue well-deserved hatred and harsh criticism) and I really wanted the cards from it. I bought a box for this back in October, but it got lost in the mail (so as advice always make sure your international orders have tracking!). I got this box on ebay somehow from a seller in the US last week. It arrived yesterday where I opened it during a reunion of college friends. This is the second time I’ve opened a box of Japanese cards. While the Wixoss box was more exciting due to the crazy artwork of each Signi, this set was no different in terms of excitement due to curiosity over what each card does. I’ve bought the Trial deck (the MTG equivalent of an Event deck/Yugioh equivalent of the Noble Knight deck) and one booster box. The problem is the pool of cards I have to deck-build with is limited by a lack of multiple copies of each card. Furthermore, importing singe cards from Japan is not cheap (as you might assume) so it’s arguably cheaper to get another box (this is the definitely irresponsibility in me, but still…). Well to start I’ll use the core from the trial deck (red/yellow) to start building some kind of deck. I spent last night brewing (can I even use that term?) a 4 color Lv 0 turbo deck, but while hilarious it was painful inconsistent (especially when there are less than 15 blue cards in this show. At this moment it’s probably just a matter of building Red splashing whatever color I have the most playable cards in. And that’s pretty much my plan. I hope to buy another box someday, but in the meantime I’ll just make due with what I’ve opened. I just put good cards into a deck. I went into this wanting to play Hera, Goddess of Jealou more than anything else. I also wanted to play Nya (nickname) since it’s my favorite card in the game. This deck however lacked a strong end game plan (win condition). I just wound up in boardstalls or failed to push that last points needed for game. The core strategy of this deck was based on siding into Bahamut game 2 to disrupt y opponent. THIS ACTUALLY WORKED. I caught all of my opponent’s off-guard, but each game I had too many dead cards in my board to take full advantage of Bahamut. I’ll be brief, because it’s 4 in the morning. I Flame of Outer World his Melgis and he loses quickly afterwards. Game 2 he gets color screwed and Bahamut defeated quickly. I got overwhelmed game 1 by Vivianne, Lady of the Lake. Game 2, I surprised my opponent with Bahamut and gained an early advantage with Barrier of Shadow (which effectively killed Change the World, Orb of Illusion). However I ended up losing after a long grind war. I scooped game 1 after our a 20 minute boardstall. Once again Bahamut got me within one turn short of lethal. Ok so to actually explain my plan. Game 1 I play Reflect and then swap to Bahamut game 2, since there’s no real my opponent would switch to Blazer. This should catch the opponent offguard. In practice Bahamut dealt absurd damage and almost won me every game 2. Of course in hidnsight cards like Nya and Rasputin are dead weight in Bahamut so a more streamlined (Mono-Red) version is probably more solid. Also Reflect/Refrain is shockingly hard to play well and I learned alot from my opponents over the course of playing it all day. I’m torn at the moment because on the word hand it’s a definite problem that this card is the best J/Ruler in the meta (game), but also it’s such a versatile (powerful) card also. Still that’s a topic for another day. Today I went the Breakers of Shadow sneak peek (the yugioh equivalent of the Pre-Release). This set is going to drastically alter the Yugioh metagame. It brings the Tcg the closest it can get to full power PePe (though we’ll never have Shock Master) by printing Performapal Pendulum Sorcerer. Alongside that this set printed some of the best generic support in years in the form of Solemn Strike, Traptrix Rafflesia and Cyber Dragon Infinity. I did win the mat though! I’m not upset with these pulls. It’s a lot more satisfying to open Yugioh packs now since BOSH has a foil card (at the worst a Super Rare) in every pack. If you count the mat (which I should sell, but really want to keep). I actually broke even despite not seeing any secret rares. I’m selling all of the cards pictured on Ebay right now. Hahaha no. One of my friends happened to build a Shiranui deck on the spot by flipping his other pulls so I took him on with my somewhat updated Nekroz deck running a Gishki sub-engine. Some spelling/name errors may occur. He starts with Lyla set 2 pass. I open double Valk, Gungnir, Vanity’s and Salvage, set both and pass. He hits the Vanity and synchro summons into Beelze using Unizombie (dumping Mezuki from the hand) and attacks me directly (I Maxx C’d him drawing into Clausolas). I then draw another Maxx C. After crying internally I pass after searching Kaleidoscope. Using Mezuki he revives Unizombie and edits its level to sync into Scarlight. He then Soul Charges and makes Shiranui Shogunsaga. He passes and I draw a 3rd Valk and pass. He plays Book of Life to remove my Clausolas and swings for overwhelming game. He sets a monster and sets a card and passes. I open Nekroz of Decisive Armor, Gishki Vision, Senju of the 1000 Hands, Salvage and Nekroz Kaleidoscope. I draw into Clausolas, ritual summon DA and banish his set monster (being reminded that Shiranui benefit from being banished). I summon Senju search Nerkoz of Trishula and attack into Mirror Force. I search another Kaleidoscope, salvage back Vision and Clausolas and pass. He sets summons Shiranui Spiritmaster and uses it to synchro summon Shiranui Samuraisaga (A card that has no buisness being a common). He attacks and passes. I draw Clausolas, Kaleidoscope into him and Trish banishing the Spiritmaster along with his Samuraisaga and a Mezuki in hand. Spirit Master destroys Trishula with its effect. I pass, then he passes. I draw into Instant Fusion, use that to summon Norden. Use Norden to make Abyss Dweller and attack. He sets a monster and a card passes. On my main phase he uses Shiranui Style Swallow Sword to destroy both my monsters. I search a Cycle and use it with Vision to summon Trishula. Trish swings for game over the course of 2 turns. He sets one and passes. I open Salvage, Valk, Unicore, Instant Fusion and Nekroz Mirror. I draw Manju. I play Manju search Kaleidoscope, use Kaleido to summon Unicore search Brio, use Brio to add Great Sorcerer. Play Mirror using Manju and Sorcerer to ritual summon Valk. Add a Gungnir to counter the Shiranui Swallow Style. Make a mistake and Instant Fusion into Norden for no value. Tribute Norden to Valk to draw a card. That card is Vanity’s Emptiness. I then proceed to win off the back of said Vanity’s to the point I gave him the out by summoning Maxx C. I Kaleidoscope out Gungnir and Clausolas a few turns later and swing for game. Well this was a fun match and also because the Shiranui are really cool. They have amazing artwork and Swallow-Style is literally a zombie type icarus attack. Will they be meta? Probably not, but months from now when Performage Damage Juggler and Plushfire get banned then maybe. What have I learned and why does this matter? Sneak peeks are like a mini regional, but worse it that card prices are harder to keep track off. People will still try to low-ball you out of your cards (a guy offered me $1 for my Araidne for example), so you have to remain vigilant. However, opening cards in that atmosphere was alot more fun because there was a lot more hype with every pack. This mat solves the problem of the pendulum zones cutting off the deck zone space, which I really like. I hope they keep making mats like this going forward. I would recommend attending sneak peeks, just like Magic Pre-Releases. Pre-Release was significantly more engaging, but the appeal of getting amazing cards early still remains. My friends both built a new deck (Shiranui and Dinomist). I want to thank each of them for both the ride to the store and for a great trip overall.